But is Google's app store really the answer? Great news for Nook owners, the Nook HD and Nook HD+ will be blessed with the Google Play store from today. An over the air software update will start rolling out today to all HD and HD+ tablets, bringing with it full blown Google Play as well as other goodies from the search giant including YouTube, Gmail and Chrome apps, plus instant access to Google Search. Barnes & Noble - the American firm behind the Nook brand - wants its tablets to be the best entertainment devices on the market, something which they have struggled to live up to since their launch last year. As well as apps and games Google Play will also bring its music, movie, book and magazine stores to the Nook tablets, giving users a huge amount of choice. 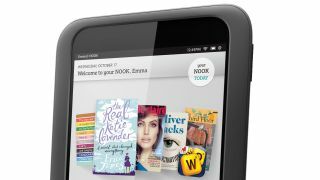 Before today, the Nook HD and HD+ offered a similar experience to Amazon's Kindle Fire HD, with a highly modified version of Android and its own fairly limited app store and media libraries. While its books, magazine and newspaper catalogues are some of the best in the market, in terms of apps, movies and music the Nook tablets struggle to keep up with the likes of the Google Nexus 7 and Samsung Galaxy Note 8.0. Jim Hilt, Managing Director at Barnes and Noble told TechRadar that he doesn't think the inclusion of Google Play on Nook devices will cannibalise its own content sales. "We're confident that the experience we have surrounding content discovery is the best on the market and our catalogue of books, magazines and newspapers is best in class. "We see the inclusion of Google Play on the Nook HD and HD+ complimenting our own content services, and where content overlaps between the two platforms we're confident people will turn to Nook to make their purchases."